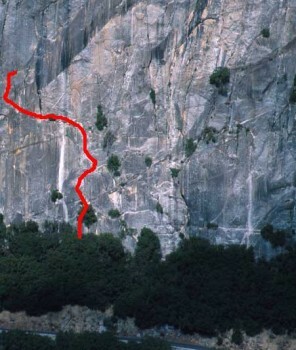 This route takes a journey through a variety of climbing techniques encountered frequently in Yosemite. Very safe, good quality climbing with an adventuresome chimney through to the west side of the pinnacle. Atop the Pinnacle, terrific views of Cascade Falls can be had. To develop your offwidth technique, toprope the right side on the way down. Which SuperTopo guidebooks include a topo for Regular Route? The incredible Pitch 2 splitter is hidden. The initial 5.6 steep knobs.